Revealed: Bentley Continental GTC Speed | What Car? 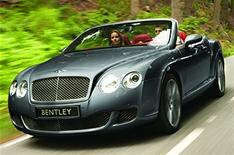 Here is the new Bentley GTC Convertible Speed that will be introduced alongside the face-lifted standard model. The standard car costs 129,700, benefiting from the recent VAT cut to be 2800 less than the previous model. The GTC Speed costs 146,100. Both cars are available to order now.